Although no one knows when or where Inferno first appeared, it definitely exists. It took the shape of a sword in order to devour more souls and came to possess individuals to further it's unholy cause. In it's sword form, Inferno came to be known as Soul Edge. Those who held the Soul Edge were unable to escape from the curse of it's evil powers. It continued to devour in darkness the souls of those who are led astray. Although it burns fiercely with the anguish and regret of the souls it had devoured, it's blade shines with an icy gleam. The first known account of Soul Edge's existance was in the 16th century. Governor Hancock of South Carolina obtained the sword from a notorious privateer in exchange for a pardon. The privateer had stolen it from a Spanish merchant, but both his and the privateer's names have been forgotten over the centuries. A friend of Hancock's, William Adams, bought the sword in a secret auction and prepared to take it back to London. That is when the sword fell into evil hands. Cervantes, a pirate in the employ of Vercci attacked Adams' ship and made off with the Soul Edge. He eventually learned to use it's power, and began harvesting souls for the sword to feast on. For two decades, Cervantes possessed the swords. Under Cervantes' control, Soul Edge often manifested itself as a pair of swords instead of just one. Many ventured to the small port town in Spain that Cervantes used as his base, and Cervantes destroyed them all easily. There was one, however, that proved to be more than a match for Soul Edge's power. This was Sophitia, a sacred warrior who was protected by Hephaestus, Greek god of the forge. During her battle with Soul Edge, Sophitia managed to actually destroy one of the twin swords. Although she was badly wounded, Soul Edge was nearly destroyed, and the loss of control caused Cervantes to lose his next battle to Taki. Another young warrior, Siegfried, stumbled upon Cervantes' body. Realizing that Cervantes was now useless to him, Soul Edge entered Cervantes' body and began a battle with Siegfried. Half of his power was gone, though, and Soul Edge was defeated. The victory turned out to be Soul Edge's, however, for when Siegfried took hold of the demonic blade, the essence of Soul Edge was able to possess the young warrior. Soul Edge used his remaining power to shower humanity with the Evil Seed, which it had been preparing all those years when Cervantes was dormant in Spain. The Evil Seed rained down all over the world, causing chaos and destruction unlike any in recorded history. Soul Edge transformed Siegfried into the foul creature Nightmare, and used his new host to rebuild his strength. The destruction of one of the twin swords and the release of the Evil Seed had left Soul Edge depleted. 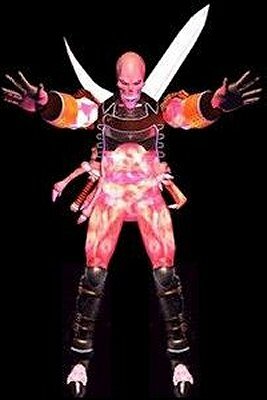 With the help of several minions, Nightmare was able to harvest many souls to power Soul Edge. As he grew stronger and stronger, Soul Edge noticed that Siegfried's will was increasing as well. Unlike Cervantes, who had gladly accepted the unholy possession, the young knight was actually attempting to resist Soul Edge's control. As Nightmare, Siegfried used some of Soul Edge's power in an attempt to ressurect his dead father Frederick. Although he succeeded in creating an apparition of his father, Siegfried realized it was not real and began to resist Soul Edge even more. He finally freed his mind from Soul Edge's influence and was able to seperate himself from Soul Edge. By this time, however, it did not matter whether Soul Edge had a host or not. He had collected so many souls that his power was tremendous, and he was able to finally manifest itself in it's true form. A trio of warriors, Kilik, Xianghua, and Maxi came to challenge the newly released Inferno. Normal humans would not have been much of a match for Inferno, but Kilik and Xianghua possessed mystical weapons that rivalled Inferno's power. Inferno killed Maxi during the battle, but the combined power of Kilik and Xianghua's weapons proved to be too much for Inferno. The evil entity was destroyed along with the Soul Edge, thus ending it's threat forever.